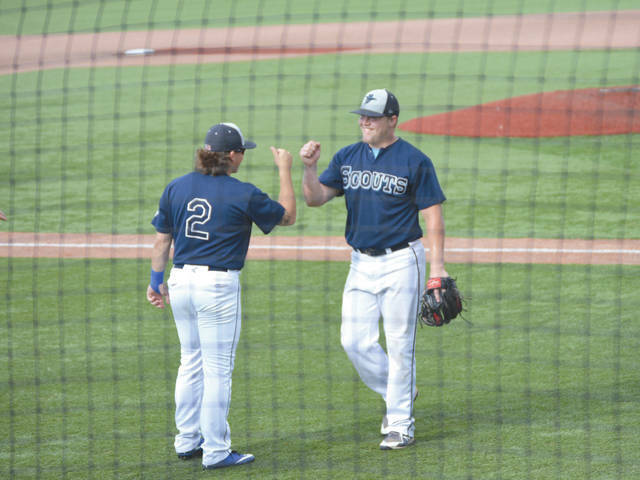 Carter Boswell (2) congratulates Luke Boylson after the Xenia Scouts regular right fielder pitched well in relief Saturday, June 30 at Grady’s Field, against the Licking County Settlers. Scouts first baseman Caleb Eder takes a pick-off throw from catcher Jarret Lindsay, as Licking County Settlers lead-off batter Casimer Sobaszek hustles back to the base. 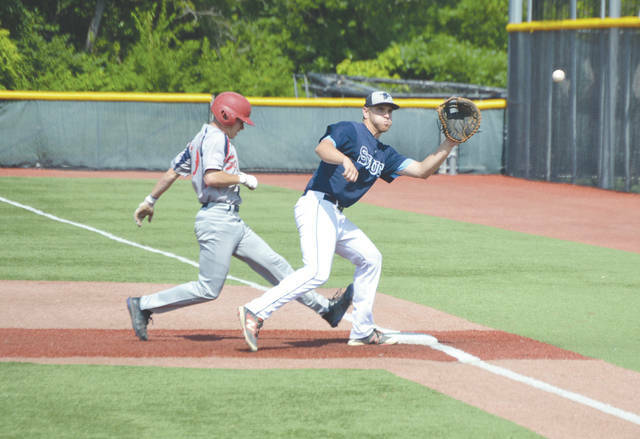 The Settlers rallied to defeat the host Xenia Scouts, June 30 at Grady’s Field in Xenia. Xenia Scouts shortstop Noah Orlando throws out a batter at first base, June 30 in a 6-5 loss to the visiting Licking County Settlers. Licking County Settlers cleanup hitter Garett Robberts fouled this seventh inning pitch off, but he singled to left on the next pitch. Robberts hit one home run in the first inning, then smacked a towering moon shot over the left field fence in the ninth inning to give visiting Licking County a 6-5 win over the Xenia Scouts, June 30 at Grady’s Field in Xenia. XENIA — Battling injuries and juggling a tired and short-staffed pitching rotation, Xenia Scouts manager Bubba Cates went with a position player to pitch the final innings of Saturday’s Great Lakes Summer Collegiate League baseball game, and the visiting Licking County Settlers (5-14) made the Scouts pay. 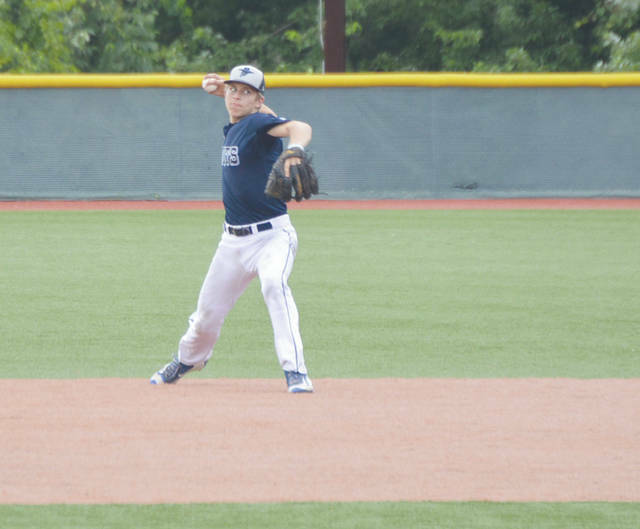 With the help of a gutty, three-inning relief pitching effort from University of Dallas right fielder Luke Boylson, the host Xenia Scouts (8-11) were able to rally to take a 5-4 lead into the ninth inning. But back-to-back homers from the Settlers no. 3 and 4 hitters in the lineup, Wabash Valley’s Sam Wilson and Cuyahoga Community College’s Garett Robberts, enabled the Settlers to rally for a 6-5 win. “We got some pitchers who are hurtin’ right now. But it’s not just us. It affects other teams in this league as well. When you get to the end of the week and you’re short of people — We had a double header yesterday where we played them — it’s tough. Our last guy we had left (after Friday’s doubleheader in Newark), he was our starter today. And when he gets done, we’ve gotta go with a position player,” Cates explained. Usually a middle reliever, Ohio Northern’s Thomas Fleser was thrown into starting duty on Saturday. The 6-foot-5, 210-pound right-handed Polar Bear scattered seven Settler hits over the first six innings. One of those hits was a solo bomb over the left-field fence, Robberts’ first of the game. Licking County pulled ahead 4-0 after two innings of play, then Fleser and the Scouts defense kept the Settlers from scoring for the next four innings. Boylson came on in the seventh inning and retired seven of the first 10 Licking County batters he faced. Then Wilson and Robberts tagged him with their home runs to turn the game back in the Settlers’ favor. Settlers manager Mike Sandman had only been the team’s skipper since last Friday. So, he was impressed with the team’s resiliency. Xenia and Licking County split Saturday’s doubleheader in Newark, the Scouts winning the second game by a 6-5 score. Seven of Xenia’s last eight games have been decided by a one-run difference. Xenia is 2-5 in those games. SCOUTS THIS WEEK: Monday, July 2 — Day off. Tuesday, July 3, 7:05 p.m. — Home: Scouts vs. Cincinnati Steam; Wednesday, July 4, 7:05 p.m. — Away: Xenia Scouts at Cincinnati Steam; Thursday, July 5, 7:05 p.m. — Home: Scouts vs. Southern Ohio Copperheads; Friday, July 6, 7:05 p.m. — Away: Xenia Scouts at Southern Ohio Copperheads (Athens); Saturday, July 7, 7:05 p.m. — Away: Xenia Scouts at Grand Lake Mariners (Celina); Sunday, July 8, 4:30 p.m. — Away: Xenia Scouts at Grand Lake Mariners (Celina). https://www.xeniagazette.com/wp-content/uploads/sites/32/2018/07/web1_BoylsonBoswell_PS.jpgCarter Boswell (2) congratulates Luke Boylson after the Xenia Scouts regular right fielder pitched well in relief Saturday, June 30 at Grady’s Field, against the Licking County Settlers. https://www.xeniagazette.com/wp-content/uploads/sites/32/2018/07/web1_CalebEder10_PS.jpgScouts first baseman Caleb Eder takes a pick-off throw from catcher Jarret Lindsay, as Licking County Settlers lead-off batter Casimer Sobaszek hustles back to the base. 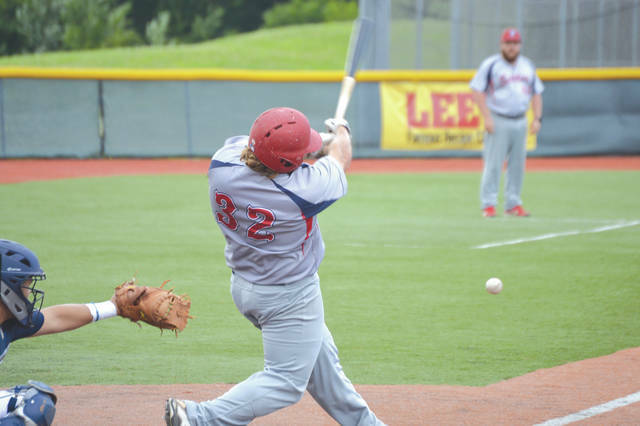 The Settlers rallied to defeat the host Xenia Scouts, June 30 at Grady’s Field in Xenia. https://www.xeniagazette.com/wp-content/uploads/sites/32/2018/07/web1_NoahOrlandoSS_PS.jpgXenia Scouts shortstop Noah Orlando throws out a batter at first base, June 30 in a 6-5 loss to the visiting Licking County Settlers. https://www.xeniagazette.com/wp-content/uploads/sites/32/2018/07/web1_GarettRobberts_PS.jpgLicking County Settlers cleanup hitter Garett Robberts fouled this seventh inning pitch off, but he singled to left on the next pitch. Robberts hit one home run in the first inning, then smacked a towering moon shot over the left field fence in the ninth inning to give visiting Licking County a 6-5 win over the Xenia Scouts, June 30 at Grady’s Field in Xenia.